Secretary-General Ban Ki-moon speaks with the press at UN Headquarters on his return from the climate change conference in Paris known as COP21. Calling the Paris Agreement on climate change “a health insurance policy for the planet,” United Nations Secretary-General Ban Ki-moon said today he never lost faith over his nine years in office that the international community could rise to the challenge and take steps to curb emission and boost climate-resilient growth. “The countries of the world have made a historic choice,” he told a news briefing at UN Headquarters in New York on his return from attending the so-called COP21 conference in Paris, as he called on Governments to put their pledges into action. “They have unanimously decided to work as one to rise to the defining challenge of our times. 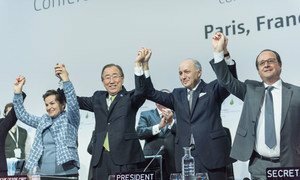 The Paris Agreement is a victory for people, for the common good, and for multilateralism. The 195 Parties to the UN Framework Convention on Climate Change (UNFCCC) on Saturday adopted the Paris Agreement after two weeks of intensive negotiations at the summit. The accord covers all crucial areas identified as essential for a landmark conclusion: mitigation – reducing emissions fast enough to achieve the temperature goal; a transparency system and global stock-take – accounting for climate action; adaptation – strengthening ability of countries to deal with climate impacts; loss and damage – strengthening ability to recover from climate impacts; and support – including finance, for nations to build clean, resilient futures. Mr. Ban said it embodies a successful new approach to global cooperation on climate change, with countries acknowledging that their national interest is best served by acting for the common good by transforming the global economy to low-emission, climate-resilient growth. He highlighted the agreement as one of his top priorities since the day he became UN Secretary-General. “For nine years, I have spoken repeatedly with nearly every world leader about how the growing human imprint on the planet threatens our lives, our economies, our security and our survival. I have mobilized business and engaged civil society. “I have never lost faith that the international community could rise to the climate challenge. Now I count on Governments, and all sectors of society, to turn these commitments into urgent, decisive action,” he concluded.